Powder snow flies as a skier navigates the slopes of Whistler Mountain during a day of alpine skiing on a bright and sunny afternoon in British Columbia, Canada. An internationally acclaimed alpine skiing destination as well as a popular summer destination, Whistler attracts more than two million visitors per year. 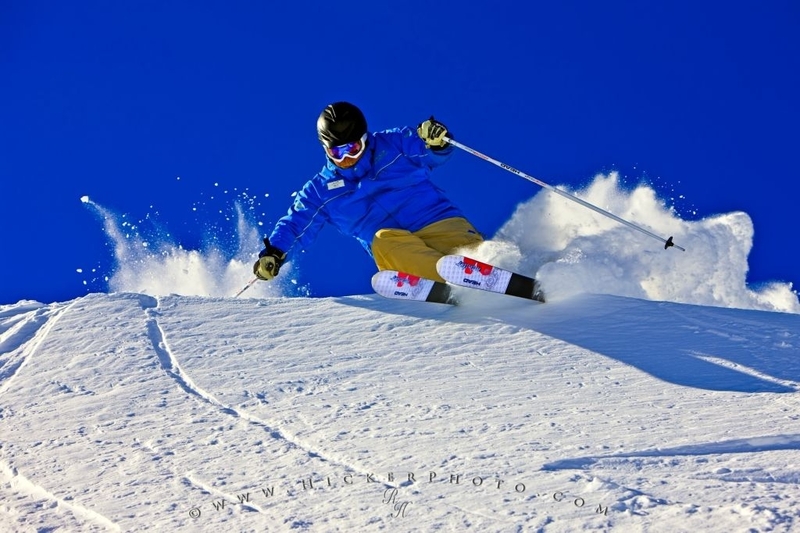 Alpine skiing is a popular winter activity in many parts of the world and many visitors come to Whistler to experience the world class facilities it has to offer. The two mountains, Whistler and Blackcomb combine to make more than 8,000 acres of skiable terrain. The mountains are serviced by 38 lifts giving skiers access to the beautiful scenery seen from the mountain tops and a huge variety of skiing levels. Action photo of a person alpine skiing on Whistler Mountain, British Columbia, Canada. Pictures from photo gallery "Whistler Pictures"
This picture is part of the photo album "Whistler Pictures" - there are more beautiful images waiting for you. ... The brand new Whistler Sliding Centre on Blackcomb Mountain will be the venue for the bobsleigh, luge, and skeleton events. Skier alpine skiing on the upper slopes of Whistler Mountain, Whistler Blackcomb, Whistler, British Columbia, Canada. Model Released. I photographed this photo with the digital SLR camera model Canon EOS-1Ds Mark III, aperture of f/5.6, exposure time of 1/1250 sec. on ISO 100, as always I used a original Canon Lens, the focus lenght for this picture was 110mm.